2 more Christmas presents finished. 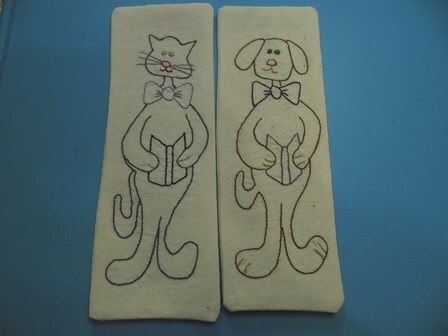 These bookmarks are from Farmyard Friends by Julie Lembit which was published in the Holiday Craft 2011 magazine. There are 6 designs but these little guys just spoke to me. Even though these guys are very simple I did have a boo boo moment when I was stitching them together. In the haste of not paying attention to what I was doing I put the backing on the wrong way and when I stitched the dog realised I was meant to have the pieces right sides facing therefore I couldn’t turn it out the right way. When I was stitching I had the embroidered side down and my mind was thinking something is wrong here but instead of stopping I kept going. I was going to trim around the edge and call it a design feature but I wasn’t happy so got out my unpicker for some reverse sewing and un did it all. I’m glad I did. 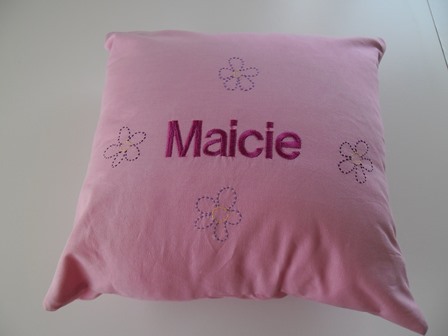 Had a I used a contrasting colour it would’ve looked ok but plain white just looked out of place around the edge. 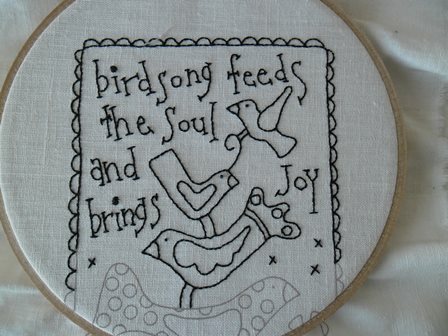 I’m doing another Rosalie Quinlan stitchery for myself Birdsong that I purchased at Urban Stitches last month. I’m halfway through it. 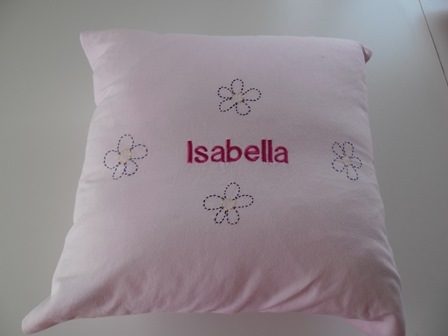 I know I’m cheating a bit by not doing all the satin stitch work as shown on the front of the packet however that just adds to the uniqueness’ of this piece. 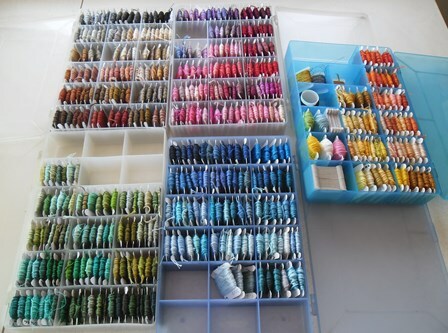 I know my stitchery will not be the same as anyone else’s. 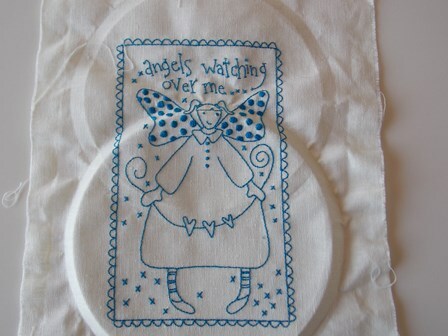 I find it interesting to observe people and see when doing hand embroidery those who hoop and those who don’t. I’m not a strict hooper or a strict free hoop embroider (are they even real terms?) For me it depends on the project I’m working on. 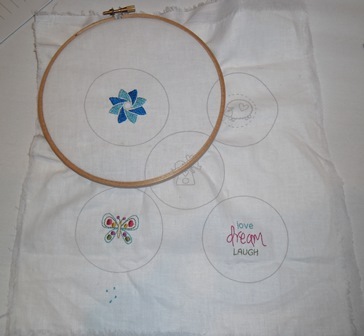 If I’m doing a pre-printed stitchery then I always like to have it in a hoop. I like how taut the fabric is in the hoop, I find I can do small fine details easier in a taut hoop. 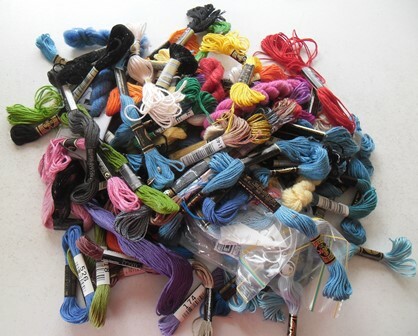 The draw back to a hoop is that often you need to re hoop it a few times due to the size of your hoop or stitchery. I don’t like the creases it leaves even though I know I’m going to iron it out anyway. I like to free hoop if I’m doing a project where it is simple lettering or features. There isn’t a lot of detail and usually I finish it quickly. For me letters on a kids book isn’t worth the time hooping. 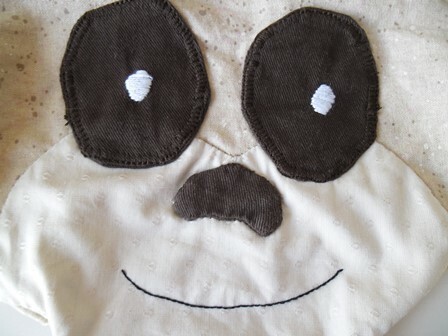 If a project is really small like satin stitching an eye onto applique I can easily control it in my hand. I’m curious as to what others do. Do you have a preference? 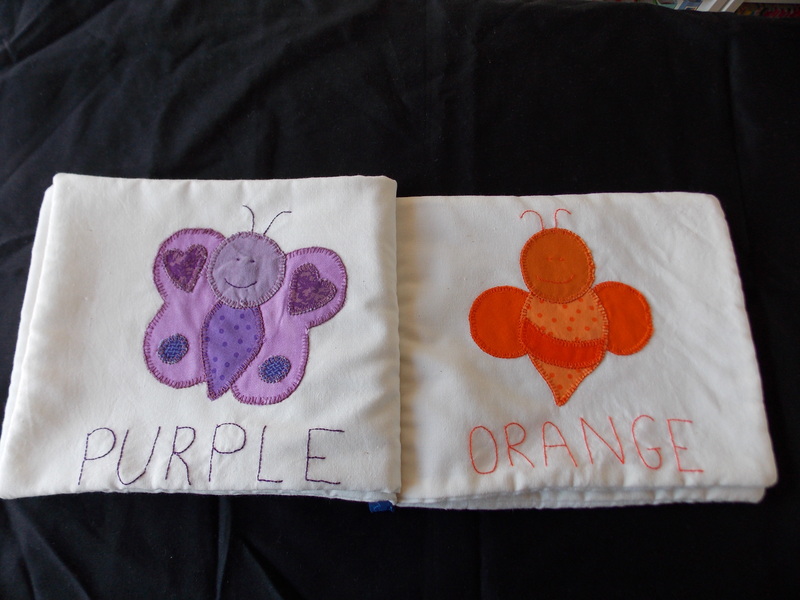 We were supplied with suggested instructions on the colours to stitch each pendant. 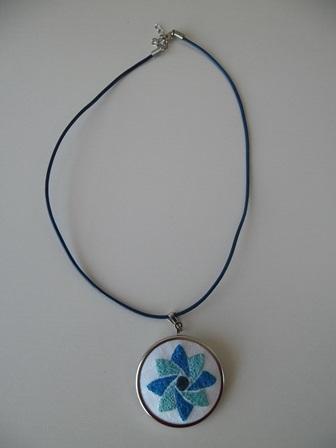 I opted to embroider this geometric one in shades of blue as it more suited my colour taste, at the time I didn’t know what I would use each pendant for. In our project pack we were supplied with the notions to make one pendant into a necklace and by chance I picked up a project bag that had a blue leather necklace in it. Once I finished stitching this pendant it was always going to be the necklace. I really like how it turned out. I paid more attention when assembling the other 3 pendants. I will wear these as hair ties. Flicking through the latest issue of Australian Patchwork and Quilting magazine (Vol 23 No 8) a project really jumped out at me. Winter Secrets by Cinzia White. 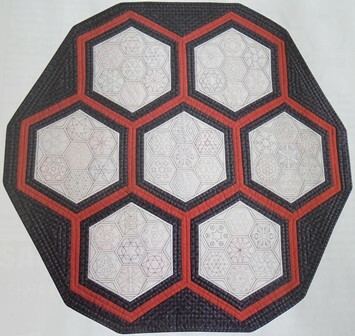 Its a table centrepiece / runner that is a giant hexagon. It is made up of 7 blocks. 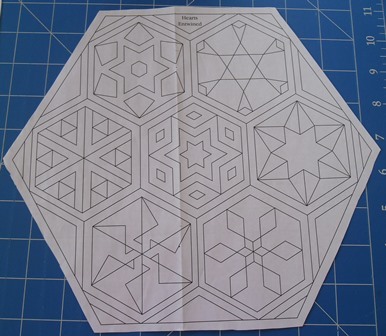 Each block is hexagon stitchery containing 7 hexagon designs. Its all just straight shapes and lines. It looks amazing. I’m a very geometric person and I love hexagons so that’s why I think I was drawn to it immediately. I’ve decided to make it but in true style I’m adding my own twist to it. This first block is called Hearts Entwinded. I’m only tracing one block out at a time. 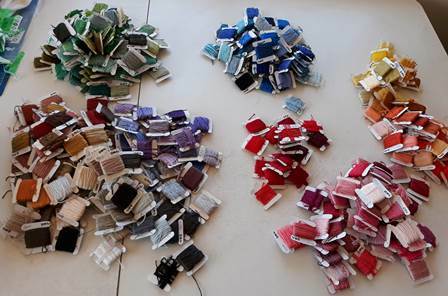 In Cinzia’s design on each block the 7 mini hexagon designs are each a different colour. 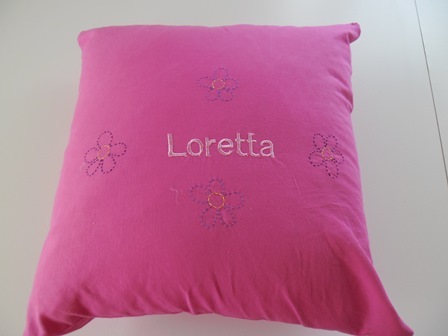 I’ve decided to do the entire stitchery in one colour. 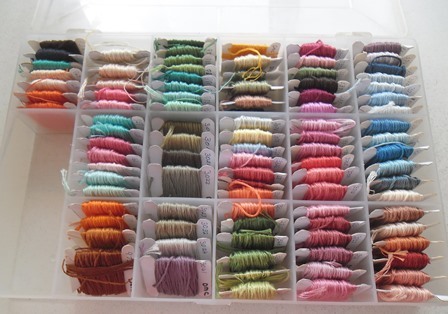 I brought a heap of embroidery threads a few weeks ago and I hope I have enough for the entire project or I’ll be hunting down that colour towards the end. It looks great multi-coloured but in my mind I can picture it in one colour. 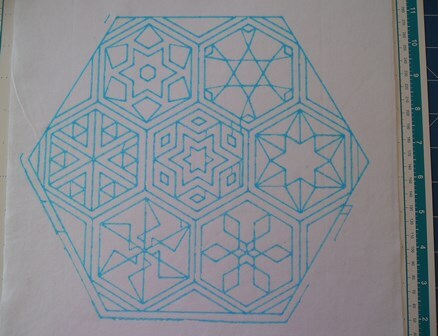 Also I’m not tracing out all the blocks by hand I’m going to use the drawing feature on my ScanNCut machine. 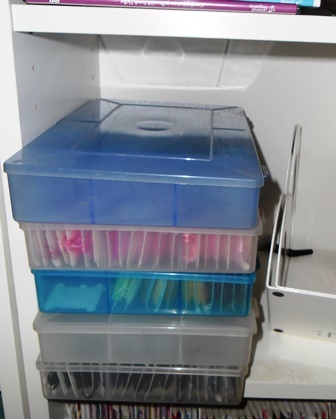 This is going to be a looong term project for me. I’m going to work on it when I can but I’m not pushing myself to finish it. I will finish it no matter how long it takes. All other projects will take precedent but when I just want to pick up something and do a couple of minutes of back stitching I’ve got something already to go. Every stitch counts. Every stitch is relaxing. I don’t do a lot of projects for me but this, this is mine.